Because of our teaching experience, your progress on a snowboard will be fast. Following our advice, you will be quickly independant and in a search of powder. Whether you are alone, with your family or with a small group of friends, a private lesson is by far the best way to learn quickly. You can choose the meeting place with your ski instructor each morning. The price for your group remains the same regardless of the number of persons. Have a look to our Special Offers !. 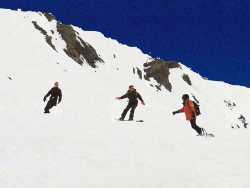 Consult our off piste page !. 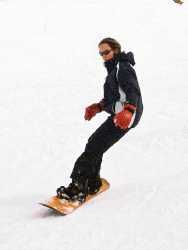 You never practice snowboard, you are complete beginner. With a small group like this, the instructor will be able to give individual attention to each student. 6 people maximum per ski instructor. "You can use the service of Paypal to pay our service by bank card. Please note that this reservation system is in test, it could be modified or removed without notice. Only some service are affected by this system. You can still book by contacting us by email. This system being paid, we add 5% feef to cover our bank charges for this service. This amount is included in the amount paid directly via PayPal. If the instructor(s) is (are) already booked, we promise at the discovery of this fact to refund you in the shortest possible time without compensation. The first customer who has booked determines the priority of the first booking."